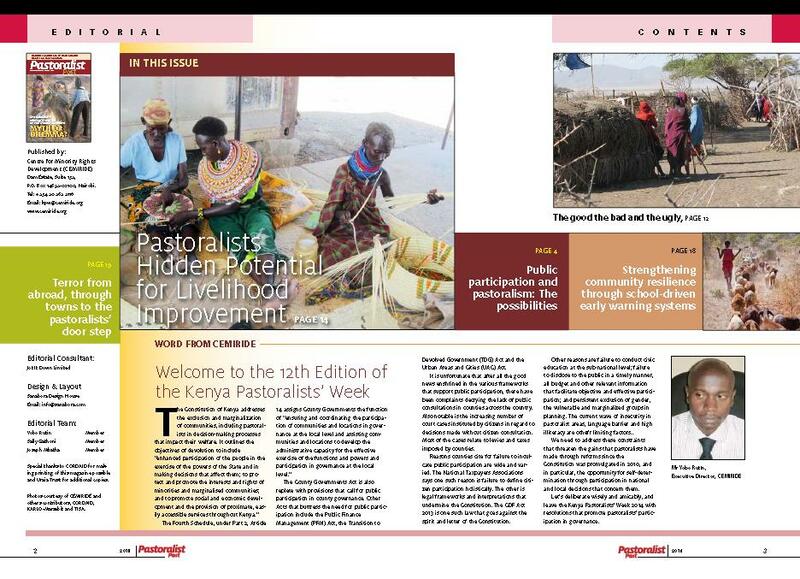 The Pastoralists Post is an annual magazine that is published and disseminated shortly before the Kenya Pastoralists’ Week with the intention of laying ground for deliberations during the KPW Conference. The Pastoralists’ Post comprises of articles submitted by pastoralist community members, academicians, civil society organisations, government agencies and other stakeholders. The articles featured relate to the thematic focus of the KPW Event that year. Kindly get in touch if you wish to submit an article for coverage in the Pastoralists Post 2017. Copies of previous Pastoralist Post Editions can be provided upon written request. JEREMIAH NYANGANYI - When will the Kenya Pastoralist week event will be and where . KPW is an annual strategic lobbying and advocacy multi- stakeholder forum that brings together pastoralist community representatives from across East Africa, elected and nominated leaders, government agencies, constitutional offices, media, scholars, researchers, CSOs/INGOs and other stakeholders. Based on issues presently affecting pastoralists, KPW establishes a platform for providing joint solutions to challenges faced and for sharing best practices and lessons regarding pastoralists’ livelihoods. With the numerous fundamental changes that have occurred in our working environment as well as the variations of the issues affecting our target groups, CEMIRIDE is currently undertaking an institutional strategic planning process to enhance our efficiency in strengthening the capacities of minorities and indigenous peoples in Kenya to advocate for and actualise their rights. This exercise is ably supported by funding by SNV World. We gladly welcome the input of all our partners and the communities we work with. Feel free to drop us a line through our contact form. CEMIRIDE filed a case before the African Commission on Human Peoples Rights on behalf of the Endorois Community in August 2003. The Endorois community, a pastoralist, hunter-gatherer and bee-keeping community numbering approximately 60,000 had lost their ancestral land without consultation or compensation in 1973 through a government gazzettement which created a national reserve (Lake Bogoria national Reserve). In February 2008, the AU adopted the ruling by the ACPHR Court directing the Government of Kenya (GOK) to offer appropriate compensation to the Endorois Community for their loss of land. At the moment, CEMIRIDE, on behalf of and in partnership with the Endorois Community is negotiating the compensation modalities with the GOK.